For most families, an airplane just takes you to your destination where new people and experiences await. For families with children on the autism spectrum, the plane itself is an experience, and not always a good one. The noises, machines and people can make the airport a scary place for a child with autism. Aiming to give parents peace of mind, employees from Horizon Air invited children on the autism spectrum to “practice the airport” this past weekend. With the help of local autism therapy center Chatterbox, The Autism Society Treasure Valley and more than 20 volunteers, families arrived at the Boise, Idaho, airport and practiced checking in, going through TSA, boarding the plane and riding in it. “[The Sky’s The Limit] is important for families, the airline and airport to better understand each other,” says Carlyle King, an Autism Society board member. King is an adult on the spectrum who joined the kids to practice and give feedback about his experience. “Going through security is always anxiety-inducing. But if they talk to you and tell you what is going to happen then it doesn’t have to be as bad,” says King. Parents who never thought they’d be able to travel with their children left with peace of mind. If anything, the parents were the nervous group. Most of the kids loved the plane and wanted to go again. Alaska Airlines partners with many organizations to support and raise awareness for children on the autism spectrum and traveling with disabilities in general. Since 2014, Alaska Airlines has hosted nine “Wings for Autism” events in partnership with the Arc of King County, Anchorage and Medford to host similar events at Seattle Tacoma International Airport, Ted Stevens International Airport in Anchorage, Alaska, and Rogue Valley International Medord Airport in Oregon, aimed at giving families a test-run at air travel. You know your child better than anyone. Think through the day from his or her perspective. What will be a trigger for them? Noises, smells, certain feelings that will agitate your child can be planned for. Once you’ve gone through the day in your head, pack accordingly. Consider ways to keep your child occupied like DVDs, toys and video games. Bring gum or a snack for takeoff and landing to avoid ear pains. Pack earplugs and books to distract them from the airport bustle. If your child is visually sensitive, pack some sunglasses. Eliminate one step from the airport process by printing your Alaska bag tags at home, in advance if you are planning on checking a bag. You can also use the Alaska app to check in and get your boarding pass from your phone – one less thing to carry. Earplugs and books to distract them from the airport bustle can be helpful. If your child is visually sensitive pack some sunglasses. Before you begin to plan your trip, see how your child feels about planes, flying and airports. Begin a dialogue with them about what will happen and go through the process in detail: how you’ll get to the airport, wait in line, go through security, find the gate, wait for the plane, wait in a boarding line, etc. Call your airport and ask if there is an autism access program in place. Many will let families take practice runs through security. Let your airline, customer service assistant and TSA screening officer know that your child has autism and explain what that means to them. Be very specific about anything your child may need or do to prepare everyone along the way. When you’re walking through security and you know your child will have an item that’s hard for them to part with, speak up and ask TSA if they can wand check it instead. Families with any extra questions or concerns about getting through security can call the TSA Cares hotline at 1-855-787-2227. You can also call your local airport with any questions about their policies. 1 comment on "The sky’s the limit: Making air travel easier for children with autism"
Hello! 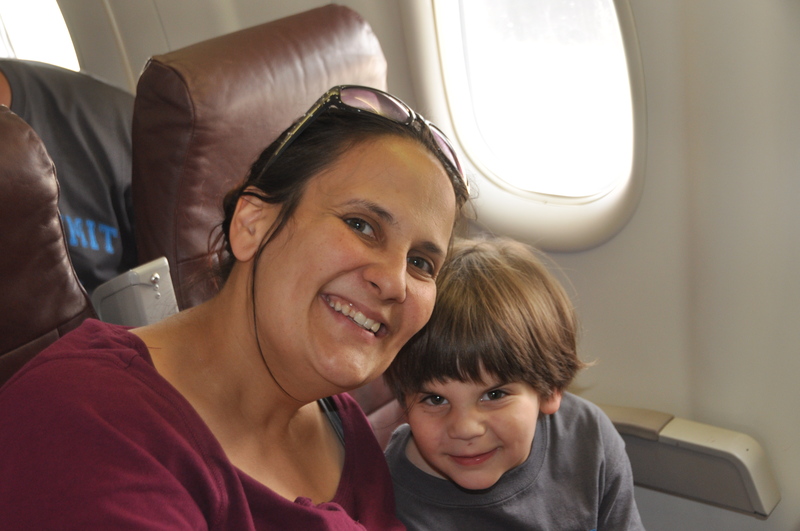 I have autism, and I love flying on Alaska Airlines. It is my favorite airline! One more tip I would have is that if there are first class seats available when you check in online the night before, the modest amount of extra money is worth it for the smaller cabin, very comfortable seats, and extra personal attention if you need it.